Although he spent almost all of his playing career as a Pittsburgh Pirate outfielder, Bill Virdon was originally signed by the Yankees in 1950 and spent his first five seasons as a pro climbing his way up New York’s minor league ladder. Then in 1954, he was included in a package of players and prospects the Yankees traded to St Louis for veteran outfielder Enos Slaughter. Virdon enjoyed a solid 12-season playing career in the NL, retiring for good in 1968. 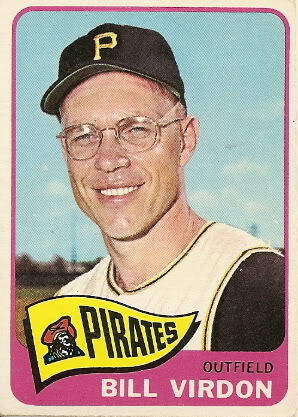 He then got into coaching and in 1972 he became skipper of the Pirates, leading Pittsburgh to a Division title in his first year as their field boss. When the team slumped the following season, Virdon was dumped. George Steinbrenner hired him to pilot the Yankees in 1974 and he led them to an 89-73 record and second-place finish in their division. “The Boss” was not truly a fan of Virdon’s low-key managing style and when the fiery Billy Martin became available during the second half of the 1975 season, Virdon was dumped again. He immediately got the manager’s job in Houston where he remained for the next seven seasons. Virdon then completed his managerial career with a two year stint as Montreal Expo skipper, finishing with a 995-921 lifetime won-loss record during his 13-seasons. I always felt it was the acquisitions of Willie Randolph, Ed Figueroa and Mickey Rivers that won the Yankees’ the 1976 pennant and not the switch from Virdon to Martin. Imagine how different Yankee history would have been if Steinbrenner kept Virdon in the Yankee dugout instead of hiring Billy. Virdon shares his June 9th birthday with this one-time Yankee outfielder and this former Yankee GM. One of the all-time great catchers in baseball history, Dickey was superb both at the plate and behind it. He hit .300 in ten of his first eleven seasons as the starting Yankee receiver and drove in over 100 runs in a season four times during his Hall of Fame career. This eleven-time All-Star played in eight World Series with New York, winning seven rings in the process. 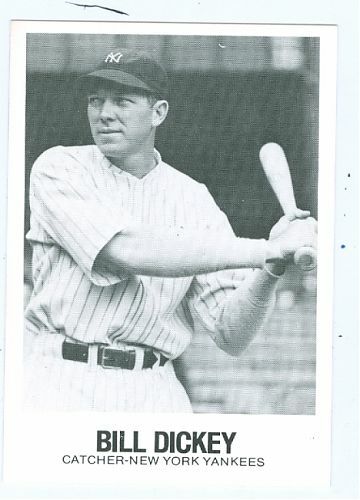 Dickey’s prime was the four-year-period from 1936 through 1939, during which he averaged 26 home runs, and 115 RBIs with a batting average of .326. He entered Military service in 1943, returning to the team in 1946. When Yankee skipper, Joe McCarthy fell ill and resigned, the team made Dickey the player-manager for the balance of the ’46 season. After leading New York to a 57-48 finish that year, he ended both his big league playing and managing career. He then accepted the Yankee’s offer to manage their Minor League team in Dickey’s hometown of Little, Rock Arkansas. After one season there, he was back in the Bronx to begin a decade long career as a Yankee coach. 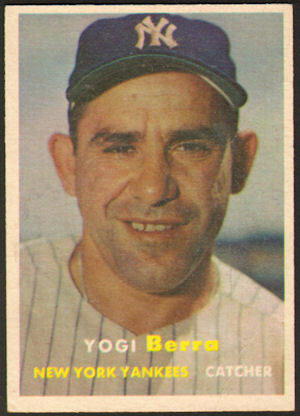 His Hall-of-Fame Yankee successor at catcher, Yogi Berra credits Dickey for teaching him how to play the position. Dickey was a quiet hard-working professional, much like his close friend and roommate, Lou Gehrig. He played hard on the field and behaved himself off of it. His playing career lasted 17 seasons. The Yankees retired his uniform number 8 (shared with Berra) and a plaque in his honor now rests in the Monument Park of the new Yankee Stadium. It certainly belongs there. Dickey shares his birthday with this one-time Yankee prospect. 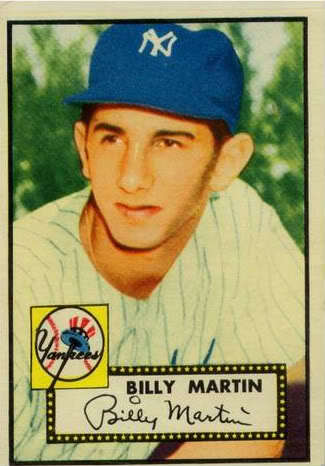 I never was a big fan of Billy Martin. I was too young to remember his playing days with the Yankees in the fifties. When he started managing in the American League, first for the Twins in 1969 and then the Tigers in 1971, I remember trying to learn more about him. Everything I read seemed to indicate he had a great will to win, a strong knowledge of the game but an extremely bad temper. This helped explain why he was fired from his first three managerial positions even after he helped turn losing teams into winners. When George Steinbrenner became managing partner of the Yankees the perfect storm necessary to bring these two unpredictable forces together in the Bronx had been formed. In the beginning, it worked marvelously. The Yankees got back to the World Series and fans filled the Stadium like never before. It didn’t last long, however. Martin’s dependence on alcohol worsened under the pressure of Steinbrenner’s meddling and the glare of the New York media. Once these fault lines became public during and after the 1977 season, Martin would never again be able to command the respect or support of his players necessary to lead them to championships. As more and more Yankees and ex-Yankees began talking and writing about their experiences while playing for Martin, a clearer picture of his addiction to alcohol, his emotional insecurity, and his inhumane behavior emerged. What respect I had for his past achievements was quickly replaced by pity for what he had become. Having written all this it is only fair to point out that there are many people who knew Martin personally and who played with him and for him on a baseball field who loved and deeply respected the guy. My opinions of him were formed from the far-away focus of a typical baseball fan. He died on Christmas day in 1989 when his truck was driven into a ditch by a friend who was allegedly driving intoxicated at the time of the accident. It has also been reported that the driver and Martin had been drinking all day. May he now be resting in peace. During his final season as Yankee skipper in 1989, Martin had this right-handed veteran starter who shares his May 16th birthday, on his pitching staff. Martin was not the Yankee manager when this other May 16th born right-hander pitched in pinstripes, during the 1981 season. This former Yankee reliever was also born on that day. After thirteen seasons as a National League second baseman, “”Hug”” became a manager. He took over as skipper of the Yankees in 1918, winning over one thousand games, six AL pennants and three World Series during his one dozen seasons in the Yankee dugout. Though he was small in stature, only 5’6″ tall and weighing just 140 pounds, Huggins was able to gain the respect and love of his players. Lou Gehrig called him “the squarest shooter I ever met in baseball.” He became seriously ill during the 1929 season when an eye infection turned into a case of blood poisoning. He died that September. He was just 50 years old. Manager – World Championships Wins Losses Pct. Huggins shares his birthday with this one-time Yankee pitcher and this former Yankee DH. Here are Huggins Yankee and lifetime managerial stats. When Del Webb and Dan Topping purchased the Yankees in 1945, they needed a baseball man to run things and they selected former Dodger and Cardinal team president, Larry MacPhail to fulfill that role. The two multi-millionaires loaned MacPhail the $900,000 he needed to purchase ten percent of the team. That presented a problem for legendary Yankee Manager, Joe McCarthy, who did not like MacPhail. It became the key reason why Marse Joe quit as the Yankee skipper 35 games into the 1946 season. He was replaced by Yankee catching legend Bill Dickey, who had been one of McCarthy’s coaches. The Yankees finished in third place in 1946 and Dickey did not even finish the season as manager, resigning that September, as soon as the Red Sox had eliminated New York from the pennant race. Two days after Dickey quit as skipper, MacPhail hired Bucky Harris to an unnamed front office position, to serve as MacPhail’s personal liason with the Yankee clubhouse. Harris then got the Manager’s job after the 1946 season ended. 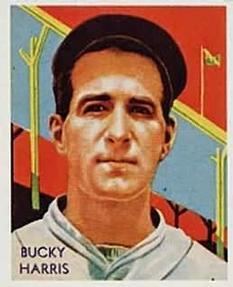 Bucky had become famous in 1926, when at just 27 years of age, he became the player manager of the Senators and led the team to a World Series Championship that season. That title earned him the nickname “The Boy Wonder.” He then continued to manage for the next two decades but had not won another World Series. The Yankee team he inherited in 1947 was getting old and ornery. His outfield was a mess. Joe DiMaggio had sore heels, Charley Keller a bad back and Tommy Henrich had turned 37 and hit just .251 in 1946. His infield wasn’t any better. First baseman Nick Etten had become an automatic out once big league pitchers returned from serving in WWII plus he was a horrible defensive first baseman. Third baseman Snuffy Stirnweiss was also a much less effective hitter against post war pitching and both second baseman Joe Gordon and shortstop Phil Rizzuto had a difficult time getting their swings back after their military service. As for pitching, Red Ruffing had retired and Spud Chandler was getting old fast. Working with MacPhail, Harris made a series of moves that turned out to be genius-like. He replaced Etten at first with 38-year old George McQuinn, an NL veteran with a decent glove and good bat. MacPhail traded Joe Gordon to the Indians for pitcher Allie Reynolds and Harris switched Stirnweiss from third to Gordon’s old spot at second and inserted rookie Billy Johnson at the hot corner. He benched Keller and made Johnny Lindell his starting left fielder. His best move was converting Yankee starter Joe Page to his closer. Each of these maneuvers panned out perfectly and with DiMaggio, Henrich and Rizzuto all enjoying bounce back seasons, the Yankees rolled to the 1947 AL Pennant, finishing a dozen games ahead of the second place Tigers. A few weeks later, Harris had his second World Championship as a Manager when the Yankees beat the Dodgers in seven games. Despite winning 94 games the following season, the Yankees finished a disappointing third in the AL Pennant race. MacPhail had also been bought out by Topping and Webb, who had installed George Weiss as the new Yankee GM. Weiss used the Yankees third place finish in ’47 as an excuse to replace Harris with his own man, Casey Stengel. If a Manager was hired in today’s times, who then won 191 regular season games during his first two years managing a team plus a World Series, he’d get a multi-year contract worth eight figures. Instead, Bucky Harris got fired. In all, Harris managed 30 years in the Majors. He was named to the Hall of Fame by the Veterans’ Committee in 1975. Harris shares his birthday with this short-time Yankee outfielder. The late George Steinbrenner probably felt he had much more in common with Jake Ruppert than any other team owner in Yankee franchise history. After all, both were sons of wealthy German-American businessmen who purchased the Yankee team when it wasn’t winning and were able to restore the franchise to glory with bunches of additional World Championships and get a magnificent new Stadium built for their team. And since Rupert got elected to the Hall of Fame in 2012, you know the Boss would have loved following his lead by also getting inducted into Cooperstown. But Georgie-boy was actually a much more meddling owner than old Jake Ruppert ever thought to be. Simply put, Ruppert kept hiring the best GMs and field managers he could find and let them make their own decisions and though Steinbrenner’s reign started the same way, he quickly morphed into a micro-managing, you-do-what-I-say type of owner. That’s why instead of Ruppert, he reminds me much more of another former Yankee team owner who is also in the Hall of Fame. His name was Larry MacPhail Sr. and he’s the guy who made today’s Pinstripe Birthday Celebrant the manager and ex-manager of the New York Yankees. Remember when Steinbrenner promised Yankee catching legend Yogi Berra that he would be New York’s skipper during the entire 1985 season and then replaced him with Billy Martin just 16 games into that season? In 1946, MacPhail was brought in as an ownership partner by Dan Topping and Del Webb when they purchased the Bronx Bombers from Ruppert’s estate. The fiery but highly innovative ex-Red and Dodgers exec was made the team’s de-facto GM. Long-time Yankee skipper, Joe McCarthy couldn’t stomach working for MacPhail and quit just 35 games into the season. MacPhail then made Bill Dickey the team’s manager but instead of giving him some job security with a longer-term contract, the new owner also hired former Senators’ “Boy Wonder” manager, Bucky Harris as a special consultant. With Harris looking over his shoulder at every move he made on the field, its easy to understand why Dickey began feeling insecure in his new role and started asking the Yankee front-office for a longer-term deal. When it became apparent that MacPhail had no intention of granting Dickey an extension during the 1946 season, the future Hall-of-Fame catcher quit with 14 games remaining on the schedule and went home to Arkansas. 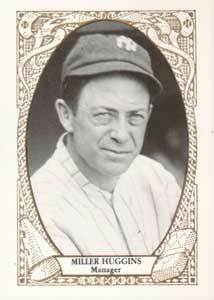 The Yanks then turned to one of Dickey’s coaches, Johnny Neun to finish the season as New York’s field boss. 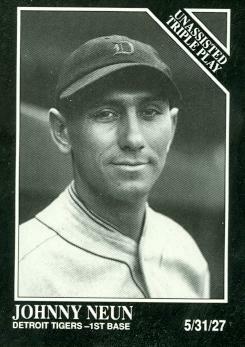 Neun had been a big league first baseman for both the Tigers and the Braves back in the 1920’s and early thirties. A switch-hitter with little power, he was never more than a back-up during his six years in the Majors but he did become famous for becoming the seventh big leaguer in history to pull off an unassisted triple play. It happened during the 1927 season and his feat was made even more memorable by the fact that one day earlier, Chicago Cubs infielder, Jimmy Cooney had also done it. After Neun retired as a player in 1934, he got a job managing in the Yankees’ farm system and soon became one of the organization’s top minor league skippers. He led both Newark and Kansas City, New York’s top minor league affiliates to league titles and was rewarded with a job on Joe McCarthy’s coaching staff, joining Dickey, Art Fletcher and Johnny Schulte. MacPhail made it clear that Neun’s hiring was on an interim basis and no one expected him to be considered a candidate for the job the next season. Neun led the Yankees to an 8-6 finish and the Baltimore native then accepted the manager’s job with the Cincinnati Reds. He spent a season and two-thirds skippering the Reds. His record when he was fired 117-137. He later became a long-time scout for the Milwaukee Braves. As expected, MacPhail ended up hiring Harris to manage the Yanks in 1947 and he did a good job, leading New York to the 1947 World Championship. But during the World Series victory celebration, an intoxicated MacPhail became so belligerent, Topping and Webb decided they needed to force him out of their partnership. With his mentor gone, Harris managed in the Bronx for one more season before being replaced by Casey Stengel. Neun shares his birthday with this former Yankee reliever.